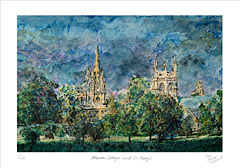 Merton College was founded in 1264 by Walter de Merton. It has the best claim to be the earliest Oxford College and was started before any established idea of how a university college should work. As a result the layout of the college developed piecemeal. 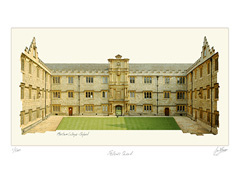 Front Quad was formed when the hall was built behind existing houses in 1266. 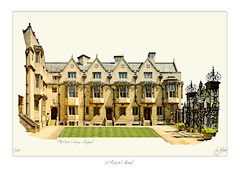 Mob Quad is Oxford's oldest quadrangle. The Treasury was built in the North East corner in 1288-91, and the South West ranges were added in 1373-8. Fellows Quad was added in 1608. The view from Christ Church Meadow shows the back of these quads. 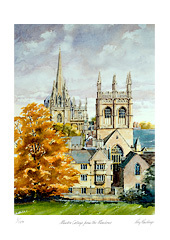 In 1448-51 the tower was built on the chapel by Robert Janyns Sr. It has eight pinnacles and a pierced battlemented balustrade with three square buttresses on each side with openings between. 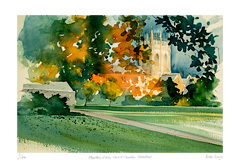 It was then restored in the 1850‘s by William Butterfield who also built the Grove building to the south of Mob Quad. The Grove Building was given a Tudor-Gothic facelift in the 1920‘s.